The 2014 high school cross-country season has stepped off in fine fashion for both the Valhalla and Steele Canyon high school teams. Steele Canyon captured the team championship in the Blue Division girls’ varsity race at this year’s Mustang Invitational, held Sept. 12 at Rohr Park in Chula Vista, while the Cougars recorded a runner-up finish in the Blue Division boys’ varsity race. In addition, Valhalla scored a meteoric first-place team finish in the Blue Division girls’ junior varsity race while, in the boys JV race, the Norsemen engineered a stunning 1-2-3 finish among top individuals en route to capturing an overall fourth-place team finish. VHS junior runner Curtis Smith led teammates Kyle Gabrielson and Trenton Sikute, both freshmen, across the finish line in the boys JV race. All three VHS runners trailed Bonita Vista freshman Toshin Agbede with a half-mile remaining in the 2.3-mile race. 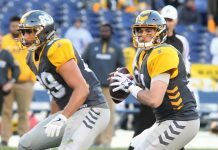 However, Norsemen trio—then running third, fifth and sixth—moved up to seize the advantage along the final straightaway. Smith claimed the top time in the race in 12:44.99, followed by Gabrielson (second) in 12:43.84 and Sikute (third) in 12:45.80. “I just trailed the whole race, the same as my team, until the end when I put a really good kick in,” Smith explained. “I was just trying to follow this guy (pointing to Smith) until the end when we just sprinted,” Gabrielson said. 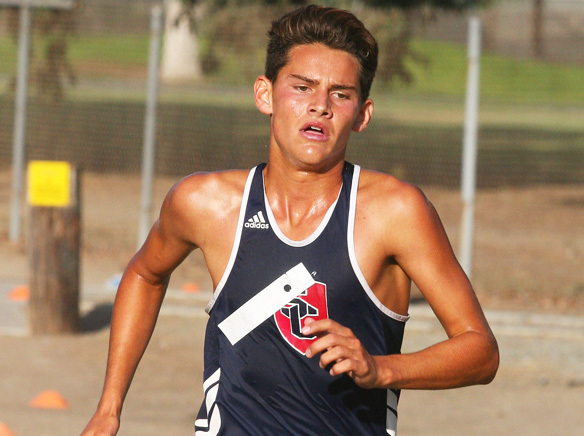 Steele Canyon senior Noah Vasquez (13:03.44) placed ninth in the 168-deep field while Helix junior Matthew Chira (13:07.57) finished 12th to highlight performances by other East County runners. Valhalla finished with 108 points to place behind Olympian (first place, 58 points), Scripps Ranch (second place, 73 points) and Otay Ranch (third place, 94 points) in the division standings. An estimated 1,600 runners competed in nine total races during the afternoon amid warm, humid conditions. Steele Canyon out-pointed runner-up Westview, 66-97, to win the 88-deep 2.3-mile Blue Division girls’ varsity race. Valhalla finished sixth with 142 points while Helix was 11th and Monte Vista was 12th in the team standings. Sophomore Shelby Wray led the Lady Cougars with a sixth-place individual finish in 14:18.06. Rounding out the top five scorers for team champion Steele Canyon were freshman Carlene Masar (ninth, 14:25.65), seniors Sophia Alcaraz (14th, 14:40.84) and Vanessa Brown (18th, 14:44.86) and junior Haley Crittenden (19th, 14:45.44). Other East County leaders included Valhalla sophomore Mariana Van Antwerp (11th, 14:35.74) and Helix junior Annette Jimenez (12th, 14:38.52). Westview senior Christa Kloha won the race in 13:30.66, followed by Eastlake freshman Keyka McFarland (second, 13:50.74) and Otay Ranch senior Darla Osuna (third, 13:53.49) — all of whom broke the 14-minute barrier. 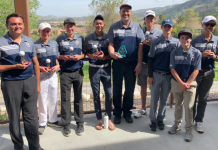 Steele Canyon placed 30 points behind team champion Westview in recording its second-place team finish. Senior Josh Paradise placed third among individuals in 16:28.04 in the 92-deep, 5K field, trailing Westview seniors Trevor Siniscalchi (first, 15:59.21) and Evan Miscuraca (second, 16:19.88). Steele Canyon’s top five scorers in the race also included sophomore Luis Pina (11th, 16:55.88), junior Ken Lautner (14th, 17:25.43) and sophomores Dominic Garza (20th, 17:33.12) and Jack Schaefer (21st, 17:33.50). East County runners accounted for four of the top nine place-finishers. 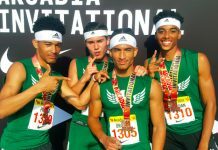 Also showing well on the warm afternoon were Valhalla junior Alex Hernandez (fifth, 16:29.99), Monte Vista junior Tyler Lopez (eighth, 16:46.57) and Valhalla senior Trent Rule (ninth, 16:47.88). Additionally, Helix junior Robert Marin was 19th in 17:32.72. Valhalla finished with a division low 30 points to edge runner-up Eastlake by four points. Eastlake recorded the top two individual finishers in the massive 254-deep, 1.65-mile race—freshmen Fiona Nielsen (11:07.84) and Jennifer Pham (11:11.22)—but the Norsemen countered with the next four runners to post the narrow win. For Valhalla, junior Lelia Clay (11:15.57) finished third among individuals, followed by freshman Molly McKee (fourth, 11:22.98), sophomore Erica Offerdahl (fifth, 11:24.06) and freshman Aimee Uebersetzig (sixth, 11:26.83). Sophomore Sarah Rickey (11:36.67) topped out the Norsemen’s five scorers in 12th place. Steele Canyon, led by top finisher Ariel Diaz (14th, 11:41.83), scooted along to a fourth-place team finish while Helix finished ninth and Monte Vista 11th in the team standings.